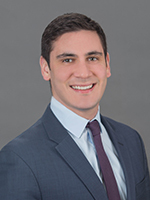 David joined Cushman & Wakefield | CRESCO Real Estate in 2017 after two years with Newmark Knight Frank. David specializes in office landlord representation, tenant representation, leasing and sales. David’s clients can attest to his excellent market knowledge, negotiation skills and tireless work ethic to accomplish his clients’ real estate objectives. In his first three years in the brokerage, David closed more than 75 transactions with more than $35MM in transaction value. David was recognized by Crain’s Cleveland Business – “Twenty in their 20s” Class of 2017 for his professional accomplishments and contributions to the community. David works primarily with the office services and retail services group and he represents some of the most active owners and users in the local Cleveland Market. David is a Cleveland native. 2814 DETROIT ROAD 2814 Detroit Rd. ARBOR COURT I 30775 Bainbridge Rd. 9050 SWEET VALLEY DRIVE 9050 Sweet Valley Dr.